The Arboretum sits at the historic heart of Rancho Santa Anita on 127 acres that comprises the Arboretum, the botanical garden, and several historical sites. 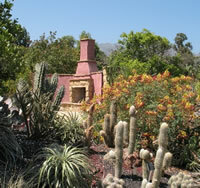 The Arboretum is operated jointly by the LA County Parks & Recreation and the LA Arboretum Foundation. This arboretum houses a wide range of plant species from regions all around the world, many of which are rare or endangered. The grounds are also home to several major historical landmarks that represent different significant phases in the history of California. Hours: The Arboretum is open year round from 9 am to 5 pm. Members to the Arboretum may enter one hour earlier at 8 am. The Arboretum is closed to all visitors on Christmas Day. This is a paid admission garden. Multiple displays beds line several paths with intimate settings in this garden. Each bed has its own colored theme and select plants are chosen for their colorful blooms and textured foliage. The area is also partly shaded by purple redbuds and Chinese fringe trees. This Victorian style cottage was built in 1885. Its lakeside location offers an exceptional vista and the entire grounds are covered with colorful perennials and large Blue Gums. This unique interactive garden in the Arboretum showcases vegetables, herbs, and wildflowers, all of which are cultivated and maintained by volunteer gardeners from the community. This exhibit serves as a wonderful demonstration garden, as well as a functioning outdoor classroom all year long. 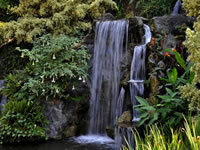 This soothing water feature is abundant with sensational foliage and colorful blooms. This favorite among photographers is mixed with temperate plants and hardy tropicals. The temperate climate of the Arboretum allows its spectacular collection of Pink Trumpet Trees to begin blooming near the end of January, and peaking at the end of March. The stunning canopies of vibrant pink blooms accents the entire landscape and wows visitors and guests of all ages. The Arboretum was instrumental in helping to introduce this South American native into the United State’s market in the early 1970’s. The Arboretum also serves as a sanctuary for wildlife in the region. The Arboretum is famous for its peafowl, which were introduced late in the 1800’s. Since their introduction, the peafowl have become naturalized to the region, and are much like sparrows and pigeons now, at home in this climate. Peafowl are not only a colorful addition to the Arboretum, but they also do wonders to help keep the snail population under control. The various gardens of the arboretum are also home to a wide range of other animals, such as mammals and small reptiles, various aquatic creatures, and a numerous species of migratory birds. The Arboretum has a spectacular library where visitors can come explore and learn about plants and the world in which we live.